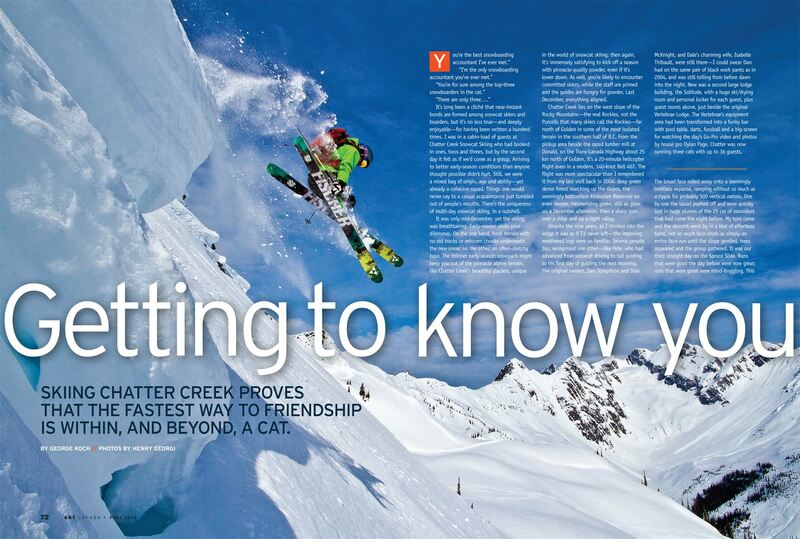 Skiing Chatter Creek Proves That The Fastest Way To Friendship Is Within, and Beyond, a Cat. It’s long been a cliché that near-instant bonds are formed among snowcat skiers and boarders, but it’s no less true—and deeply enjoyable—for having been written a hundred times. I was in a cabin-load of guests at Chatter Creek Snowcat Skiing who had booked in ones, twos and threes, but by the second day it felt as if we’d come as a group. Arriving to better early-season conditions than anyone thought possible didn’t hurt. Still, we were a mixed bag of origin, age and ability—yet already a cohesive squad. Things one would never say to a casual acquaintance just tumbled out of people’s mouths. There’s the uniqueness of multi-day snowcat skiing, in a nutshell. It was only mid-December, yet the skiing was breathtaking. Early-season visits pose dilemmas. On the one hand, fresh terrain with no old tracks or refrozen chunks underneath the new snow; on the other, an often-sketchy base. The thinner early-season snowpack might keep you out of the pinnacle alpine terrain, like Chatter Creek’s beautiful glaciers, unique in the world of snowcat skiing; then again, it’s immensely satisfying to kick off a season with pinnacle-quality powder, even if it’s lower down. As well, you’re likely to encounter committed skiers, while the staff are primed and the guides are hungry for powder. Last December, everything aligned. 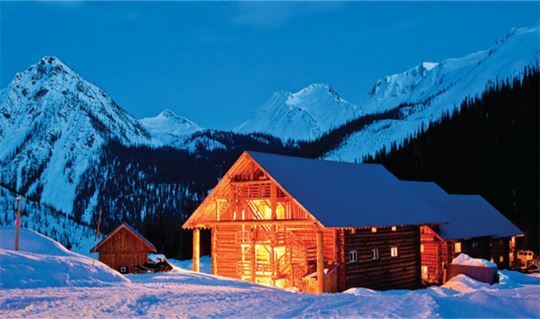 Chatter Creek lies on the west slope of the Rocky Mountains—the real Rockies, not the Purcells that many skiers call the Rockies—far north of Golden in some of the most isolated terrain in the southern half of B.C. From the pickup area beside the razed lumber mill at Donald, on the Trans-Canada Highway about 25 km north of Golden, it’s a 20-minute helicopter flight even in a modern, 140-knot Bell 407. The flight was more spectacular than I remembered it from my last visit back in 2004: deep green dense forest marching up the slopes, the seemingly bottomless Kinbasket Reservoir an even deeper, mesmerizing green, still as glass on a December afternoon, then a sharp turn over a ridge and up a tight valley. Despite the nine years, as I strolled into the lodge it was as if I’d never left—the imposing weathered logs were so familiar. Several people, too, recognized one other—like Pete, who had advanced from snowcat driving to tail guiding to his first day of guiding the next morning. The original owners, Dan Josephson and Dale McKnight, and Dale’s charming wife, Isabelle Thibault, were still there—I could swear Dan had on the same pair of black work pants as in 2004, and was still toiling from before dawn into the night. New was a second large lodge building, the Solitude, with a huge ski/drying room and personal locker for each guest, plus guest rooms above, just beside the original Vertebrae Lodge. The Vertebrae’s equipment area had been transformed into a funky bar with pool table, darts, fussball and a big-screen for watching the day’s Go-Pro video and photos by house pro Dylan Page. Chatter was now running three cats with up to 36 guests. The broad face rolled away onto a seemingly limitless expanse, ramping without so much as a ripple for probably 500 vertical metres. One by one the squad pushed off and were quickly lost in huge plumes of the 25 cm of moondust that had come the night before. My turn came and the descent went by in a blur of effortless turns, not so much face-shots as simply an entire face-run until the slope gentled, trees appeared and the group gathered. It was our third straight day on the Spruce Slide. Runs that were good the day before were now great; runs that were great were mind-boggling. This morning’s descent would count as apex skiing anywhere on the planet, any time of the season. Roll back to our first morning. The three cats go three separate ways. Our guide, Steven, directs our cat down the valley, then up a long ridge to some of Chatter’s classic lower treed runs, starting with Enchanted Forest. Our group includes skiers Mike and Dan from Mississauga, Ontario, Dan making his first-ever powder turns; snowboarding brothers Rob and Ryan from Banff; and buddies Dean, Gavin and Scott. Scott’s a prosperous Chrysler dealer in Edmonton who drives a BMW, Gavin’s an accountant in Fort St. John, B.C.—the best snowboarding accountant I’d ever met—and Dean’s a welder/fabricator who loves to ski at rustic Powder King. The group’s tail guide was Marie, and owner Dan was driving the cat. Ryan quickly synched his iPod with the cat’s sound system and played an eclectic mix put together by his girlfriend, who seemed to have stumbled upon every hit from when I was eight and Ryan and Rob were not even a gleam in their parents’ eyes. There was Nina Simone, “Sinnerman, where you gonna run to…”; Dolly Parton, “…flaming locks of auburn hair…”; and Steely Dan, “you go back, Jack, do it again”—encapsulating the skiing life in seven words. 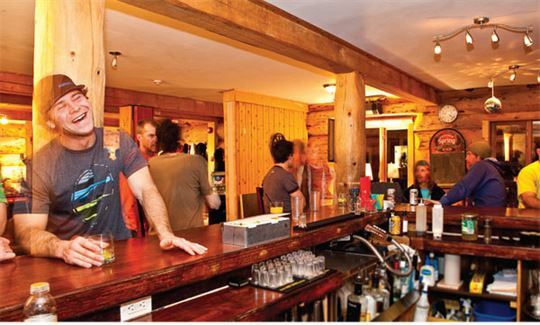 I later found out Rob and Ryan are former sponsored pro riders, and that Rob also owns the Devil’s Gap bar in Banff, both very low-key about it all. The base was about 200 cm at treeline, almost the deepest December snowpack in Chatter’s 13-year history. One’s harder turns yielded about 30-40 cm of penetration, and the open trees in the near-alpine were great. As we descended, the perfect base gradually gave way to some deep holes, barely covered trees and open creekbeds. Down there you simply had to check your speed to avoid an early-season injury. When the guide starts making safety turns, that’s a signal. Nor was there any of the early-season depth hoar that’s standard in the Rockies, a big safety plus. From the ridgetop, I gazed across the valley at vaulting rock walls, high cirques and steep couloirs, some of the terrain I’d skied last time. That included REZM—Right Een Zee Middle—formed by two near-identical ridges creating a U-shaped, north-facing hanging valley rolling onto a steep face. My best run in 2004. Might the snowpack already be stable enough to venture up out of the trees? “We can’t ski that mid-winter stuff yet,” Steven replied curtly. “The roads aren’t built, the visibility is poor…” We were lucky to be on Spruce Slide, which had been unskiable the entire previous season. Either Steven had wanted to surprise us all along, or I had started him thinking, because after a couple more runs the cat took us up the valley’s other side and, lo and behold, up atop REZM. The murky light made the younger guys suddenly urge me to go right after Steven, and I worked hard to live up to P.J. O’Rourke’s swaggering claim that age and guile beat youth, beauty and a bad haircut. REZM was just as good as I remembered it, perhaps better. Steven had another surprise for us on the next lap. After skiing the upper pitch of REZM, he hooked skier’s right over the bordering ridge to a genuinely steep couloir, Rez Dog. Steven ski-cut it, and then the snowboarders went wild banking off the rims and hucking any protuberance in sight. This first day back at Chatter would have ranked as top-tier any time of the season. We returned to the lodge to find a hard-partying crowd from the other cats, including a crew of 12 youngish oilpatchers from Calgary. Several sported weird varieties of retro mustaches, two resembling Iraqi secret police, and there were numerous pairs of bloodshot eyes and caps askew, while the hot tub antics sent several other guests fleeing. Photos and videos on the bar’s big-screen kept the day’s adventures alive. Dinner upstairs was simply superb. The truffle soup was possibly the best soup I’d ever tasted, and was followed by a thick and incredibly juicy striploin atop asparagus, tomatoes and a flat potato, rounded out by a strawberry and cream dessert in a pastry shell. Lips were smacking, tummies were being rubbed and exhausted guests were staggering off to bed by 9:00 p.m. I also spent some time chatting with Isabelle. 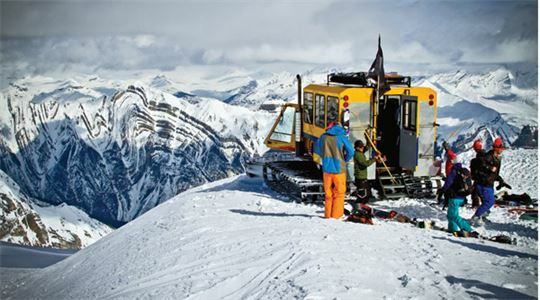 Because much of Chatter Creek’s vast terrain lease sprawls beyond the range of snowcats, she explained, the company has begun offering some heli-skiing. Typically a group will transform its incoming day into a heli-day, and occasionally there’s also by-the-run heli-skiing at day’s end. She said Chatter is hoping to build a satellite lodge in the southern terrain, dedicated to heli-skiing. In the meantime, they plan to add more guest rooms in the current lodge and operate pure heli-skiing tours into the southern terrain. As we spoke, the very light snowfall that had begun in the afternoon settled in. By bedtime, eyeball-sized flakes were cascading down. We could only hope it continued all night. It did. After the incredible descent of Spruce Slide, the steeper and much longer Tin Horn was even better. I was breathing through my Avalung the entire way, submerged in blower but for popping up every few turns to map the next dozen or so giant burnt trees. Later, the Media Cliffs were great, a mix of pleasant glades, cliffs and free-falling shots blurring the line between skiing and pure gravitational hurtle. Dan was really coming on strong—great to see on only his third day of powder—Dean was cranking out the turns and one of the three snowboarders was in the air at any given moment. I always ask the guide to let me know when we’re about to start the last run, creating a needed transition for gathering my meagre inner resources and not breaking down in blubbering sobs down at the cat. That time came with Crystal Light. After a rolling opening it began tilting to an admirable gradient, first a short pitch, then a longer ramp that opened in a small boulder huck, ran smooth and true for multiple rushing turns, then tightened into some dense but ultimately navigable alders, the steepest and deepest turns coming just above the pickup. Everyone got something unique out of it, Rob and Ryan hucking multiple features, Dan smiling hugely when told he’d descended something beyond double-black-diamond at most resorts, and Gavin feeling intensely glad he’d resumed boarding after a marriage-related hiatus. It was 3:00 p.m. and the beers came out at the back of the cat. The pale yellow mid-winter sun peeked between cloud layers and hung over distant ridges. A few snowflakes drifted gently down. There wasn’t a breath of wind. As we crested a ridge on the way back to the lodge and our helicopter ride to hard reality, REZM lay framed through a slot of trees across the valley, grey-blue in the afternoon shade, backlit by an ice-blue mid-winter sky. LOCATION: Roughly 100 km northwest of Golden, B.C. with heli-transfer pickup at Donald, a 25-minute drive from Golden. SIZE OF AREA: 238 square km of total permit, approx. 50 km of snowcat roads, 95 named descents, including a glacier, with maximum skiable vertical drop of about 800m (longer for some heli runs). ELEVATIONS: Lowest pickup 1,200m; highest snowcat drop-off, 2,800m on Vertebrae Glacier. PRICING AND TIMING: Packages or “tours” of three snowcats and up to 36 guests rotate among two, three and four days, from mid-December through early April. Prices range from under $1,600 for a low-season two-day tour to over $4,200 for a high-season four-day tour. Prices include taxes and helicopter transfer from Donald. Not included: liquor, gratuities, fat-ski and avalanche airbag rentals and heli-skiing.